Katonah, NY, January 10, 2019 — The Katonah Museum of Art (KMA) is pleased to present LandEscape: New Visions of the Landscape from the Early 20th and 21st Centuries on view from March 17 - June 16, 2019. 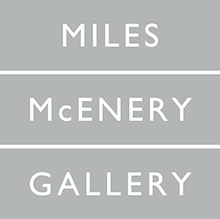 The show juxtaposes the work of early 20th century American modernist painters who exhibited their innovative works at the groundbreaking 1913 Armory Show with contemporary artists from the 21st century who have rediscovered and reinvigorated the genre. Curated by Olga Dekalo, this show is comprised of approximately 30 works and reveals how a diverse range of artists broke from the established landscape painting traditions of their predecessors to create a new visual language that profoundly changed the way the genre was perceived. Artists such as Marsden Hartley, John Marin, Alfred Maurer, Helen Torr and Marguerite Zorach all engaged with what was considered to be an unexceptional genre. They removed it from its realist roots and radically altered the form and style of landscape painting. One hundred years later the same innovative impulse has once again emerged in the works of contemporary artists Alex Katz, Jo Baer, April Gornik, Lois Dodd, Judy Pfaff, Ryan Nord Kitchen and Shara Hughes who have again reinterpreted the landscape. The two eras share a central theme, which is a desire to reflect an artistic vision that deliberately takes place outside of urban centers and embraces the experience of small towns and the rural countryside, a notion that reflects a necessary economic and environmental escape by artists from the city. The historic works in the show such as Alfred Maurer’s vivid and expressionistic Landscape (Autumn), 1909 and Marguerite Zorach’s Moonlight, 1910, confirm the influence of European modernists. Of particular note is Marsden Hartley’s vibrant Dogtown c.1934 on loan from the Frederick R. Weisman Art Museum, Minneapolis, MN. Dogtown, in Gloucester, MA was a colonial settlement that had been abandoned by 1830 and was regarded in Hartley’s day as the province of vagabonds, witches and feral dogs. Hartley described it as a cross between Easter Island and Stonehenge and transformed the barren scenery into a dramatic, expressionist landscape. 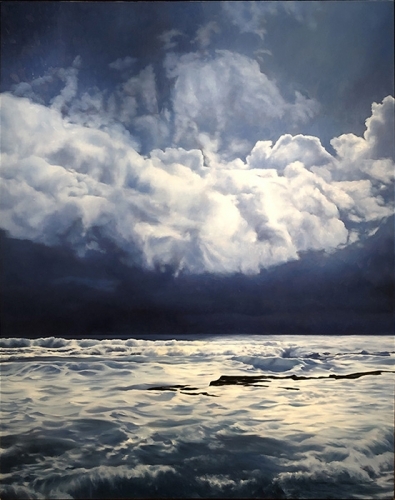 In 21st Century, April Gornik’s Sun and Storm, 2006 captures the vast, empty environment and the power of nature. At the same time, Shara Hughes’s The Not Dark Dark Spots, 2017 echoes the vivid palette and style of her 20th modernist predecessors.